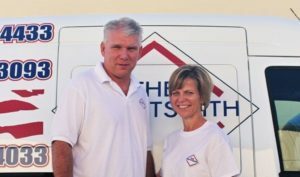 Lee and Sharon Conti came to The Groutsmith with corporate backgrounds. Lee was a seasoned operations manager while Sharon was an experienced sales professional. When the Contis decided to leave the corporate world and put their skills to work as business owners, they decided to pursue franchising for two reasons: it provided a proven business model and a faster path to success. The Contis chose The Groutsmith for its simplicity, family-like team, and ability to become experts in a service that’s in constant demand. 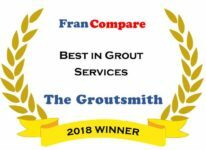 Since opening their franchise in August of 2015, the Contis’ Groutsmith franchise has steadily grown and turned a healthy profit, making it a viable business and rewarding employer for their team of technicians. Read the full story, packed with Sharon’s own words below. Before buying their franchise, Lee and Sharon had spent years in corporate America. Lee was an operations manager; Sharon was in sales. Ready for something new, the Contis decided that despite having no experience owning a business, the skills they developed throughout their careers gave them a big opportunity if paired with the right business model. Instead of wasting time and money starting a business from scratch, The Contis decided to franchise so they could hit the ground running and build on the brand’s success. When they first learned about The Groutsmith, it first seemed like an odd fit. Tile and grout cleaning, restoration and repair? But the more they learned about the opportunity, the more they learned the business model and skill set was incredibly simple to learn, the products were exceptional, and the service was sought-after. Looking back on their onboarding experience, the Contis recount a smooth process and simple earnings forecast based on available numbers and the factors specific to how they wanted to run the business. A low-cost initial fee and minimal overhead made it possible for the Contis to get their business up and running––and cash-flow-positive, quickly after getting started. After getting their business up and running, the Contis found the close-knit support and feedback from customers to be much more than they expected. Both were big factors for the business in general. For the Contis, one of the most refreshing aspects of owning a franchise like this is the fact that every day is different. Each person has their own role, but the setting and type of work done every day changes––something both Lee and Sharon find appealing. What’s more, everyone gets to put their own skills to work for the business. When asked what they like most about being Groutsmith franchise owners, Sharon boils it down into two things: satisfaction and validation. Making customers in their community happy and growing the business through word-of-mouth from one homeowner to another brings a satisfaction few other businesses can offer.